Beautiful and Extremely Fine Silk and Wool Saber Vintage Persian Khorassan Rug, Country of Origin / Rug Type: Vintage Persian Rug, Circa Date: Late 20th Century – This glistening silk and wool vintage Persian Khorassan rug, singed Saber, is a masterpiece of complex and magnificent beauty. 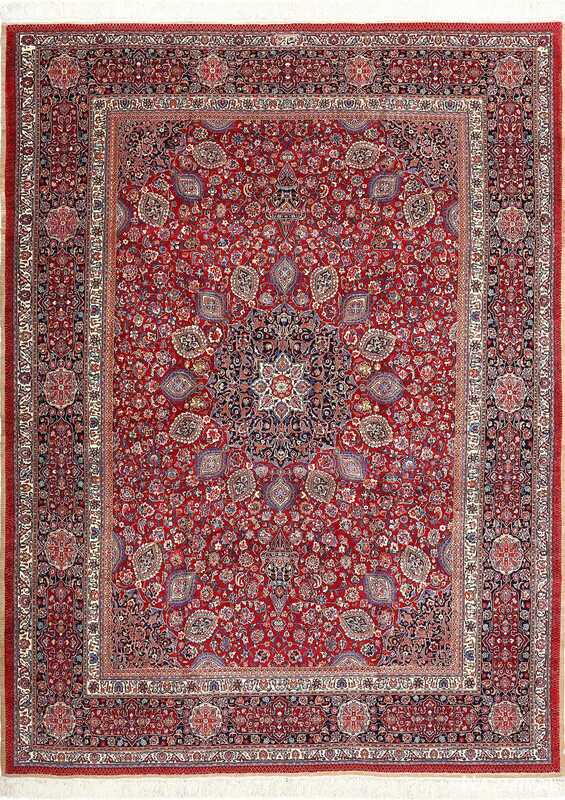 This beautiful vintage Persian rug boasts a rich crimson hue saturates the majority of the facade, contrasting vividly with an ebony centerpiece. This same deep blue material is also used in the outer most zig zag design guard that hems the entire Persian Khorassan rug. Detailed decorations in pure silky white, bright blue, sunset coral and sandy beige are added for an artistically delicious flair. 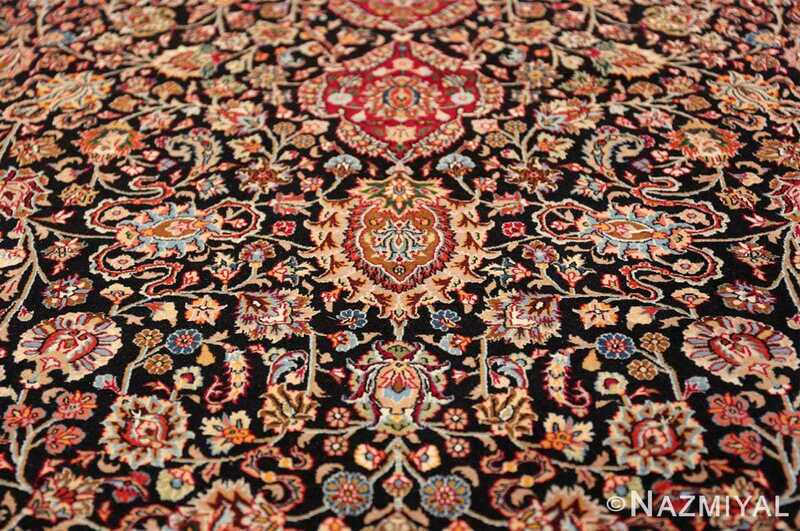 The nucleus of this magnificent silk and wool rug is an extremely refined, elegant diamond shape. 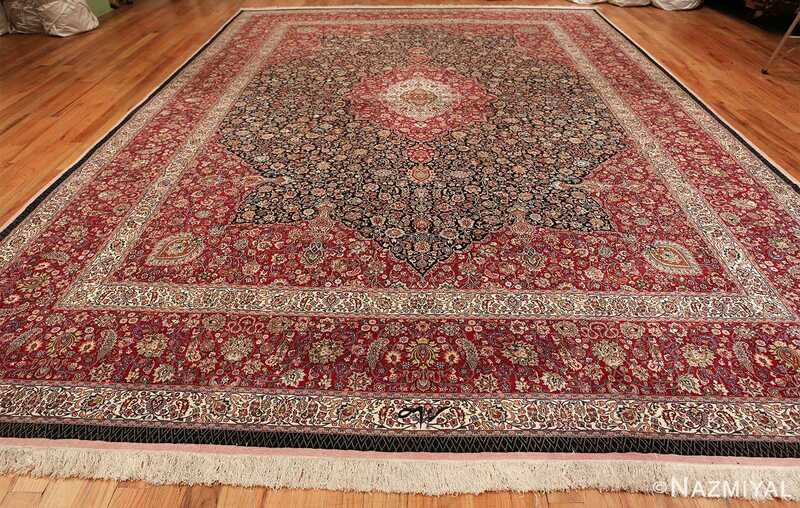 This central medallion motif is adorned with a silky deep blue finish and floral ornamentation in a variety of colors. This impressive Persian rug features baby blue and neutral tan flower stems connect exotic dragon fruit flowers, small star shaped blossoms, daisies, and hydrangeas. 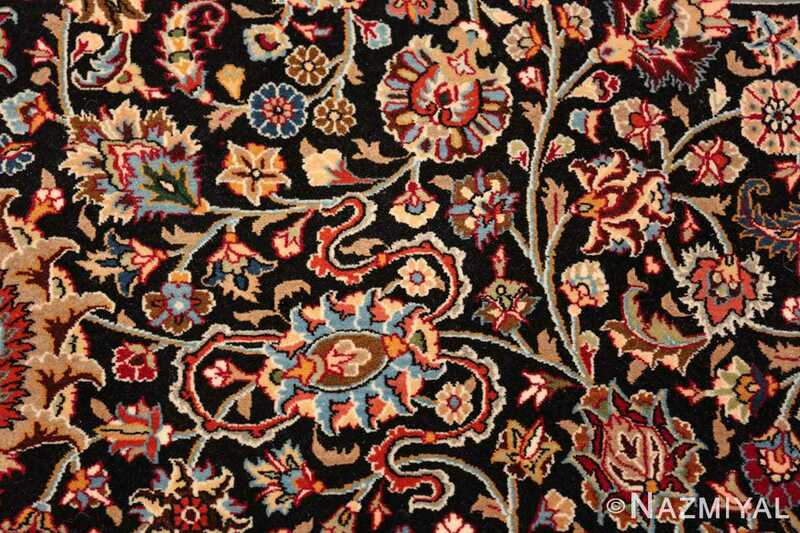 This stunningly diverse amalgam of idyllic scenery creates a truly scrumptious garden like picture. 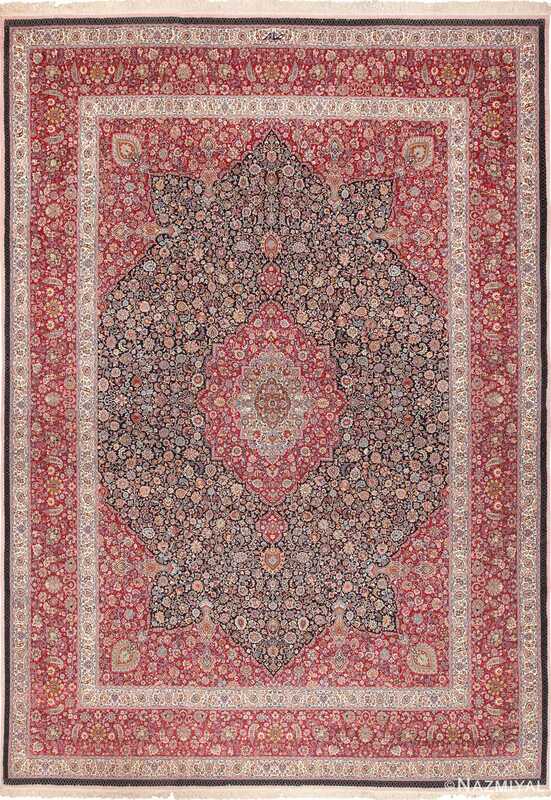 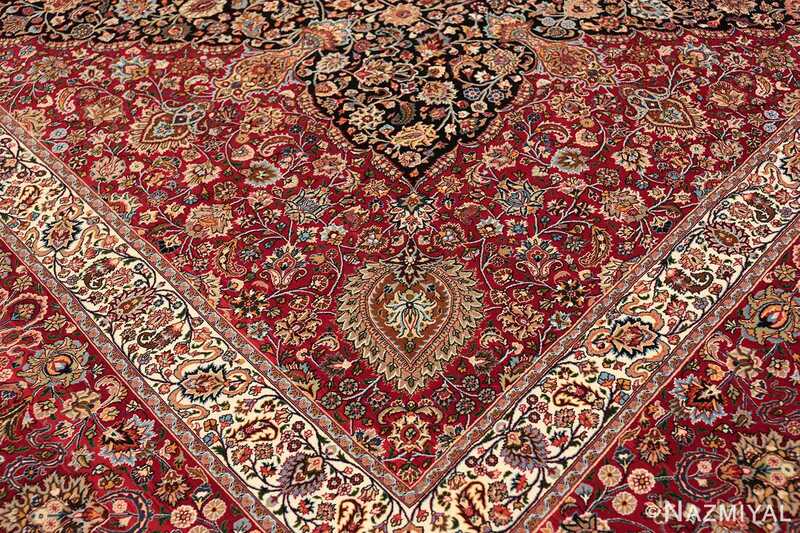 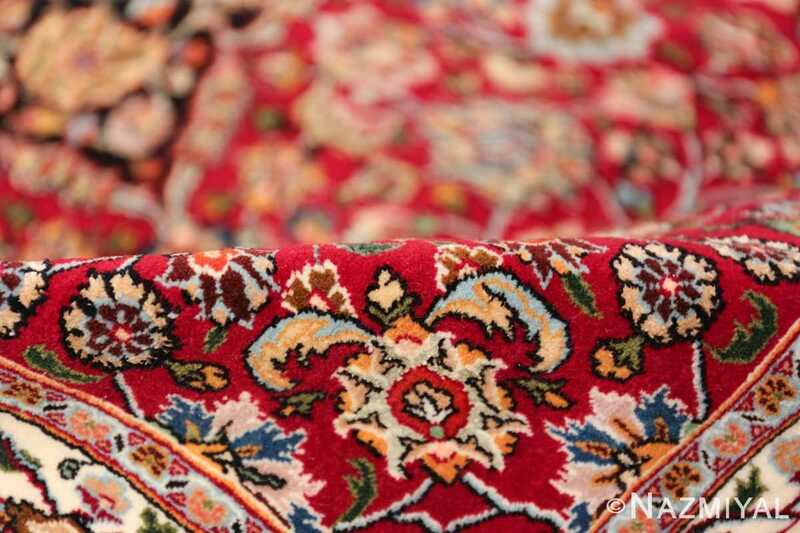 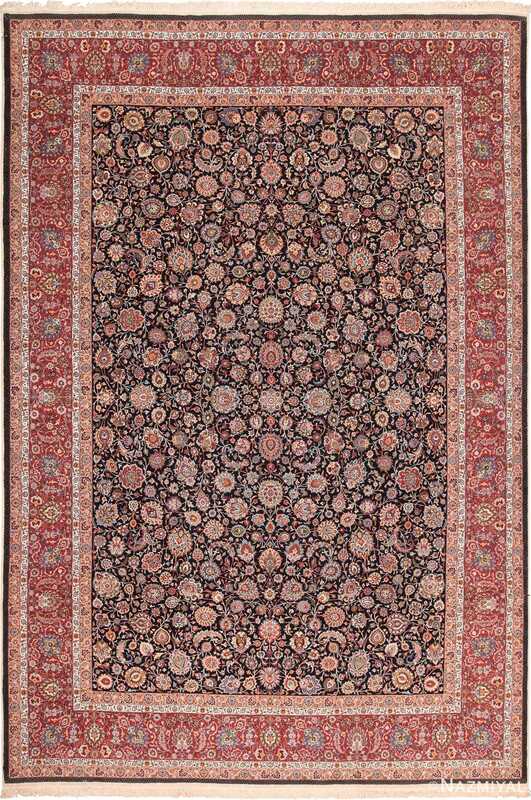 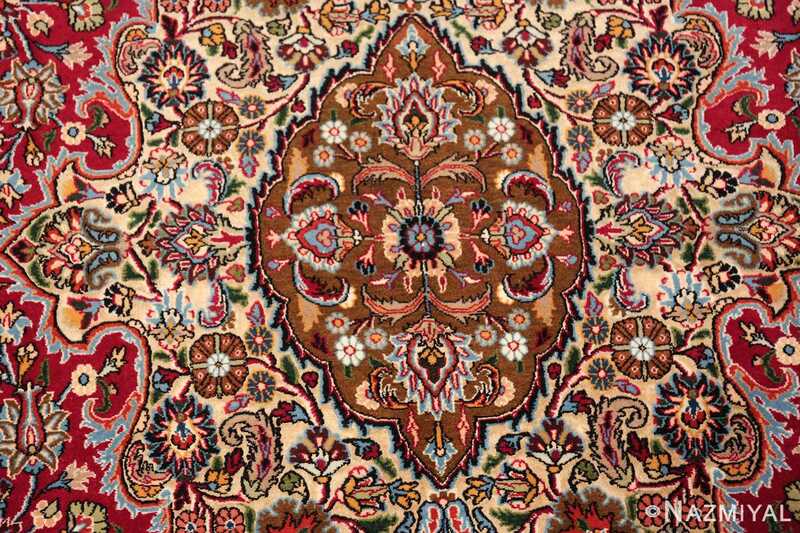 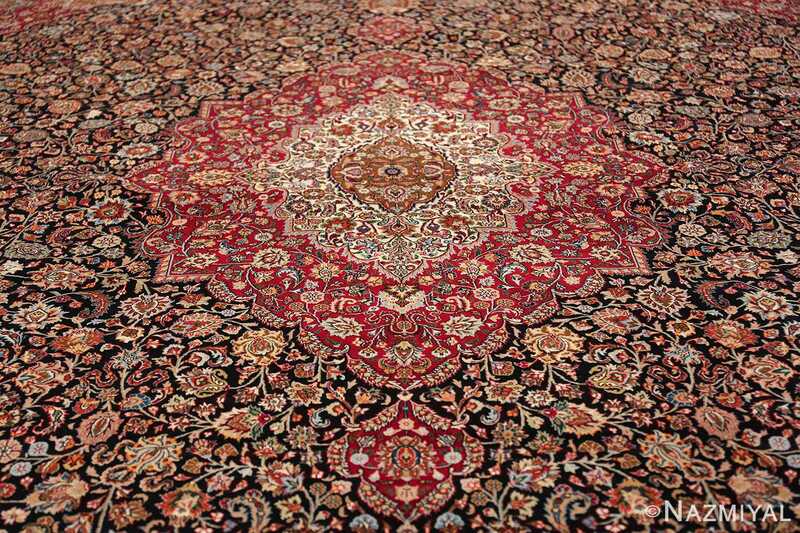 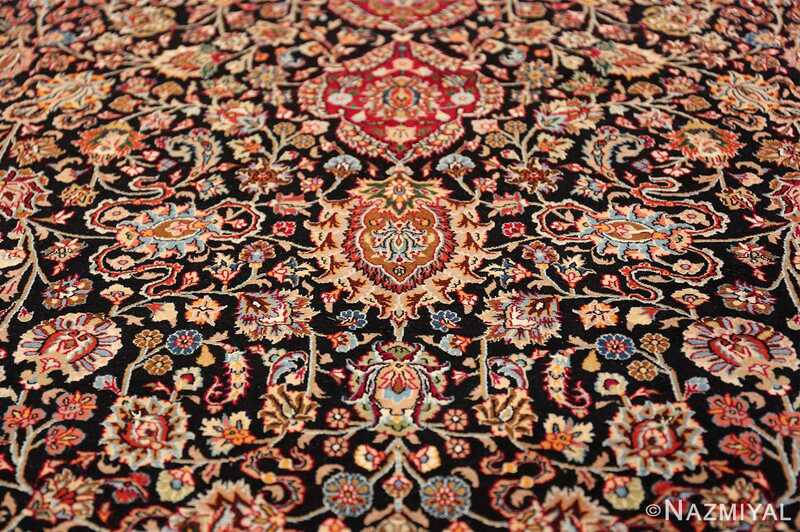 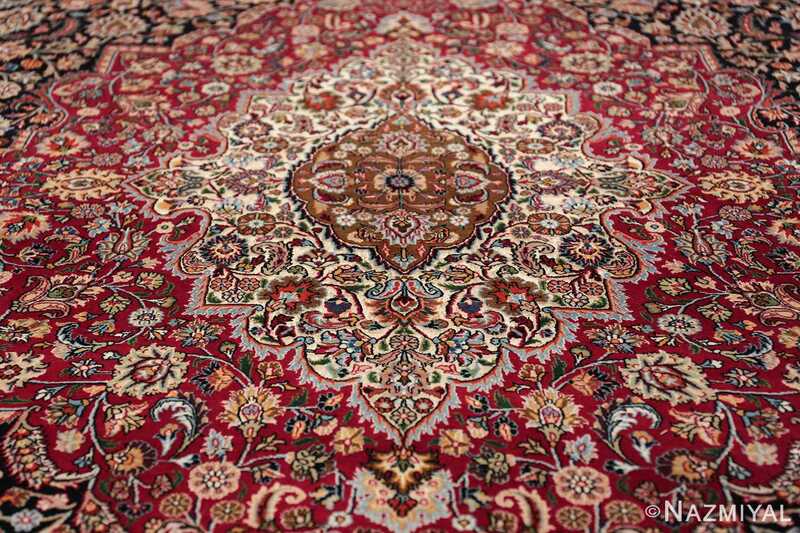 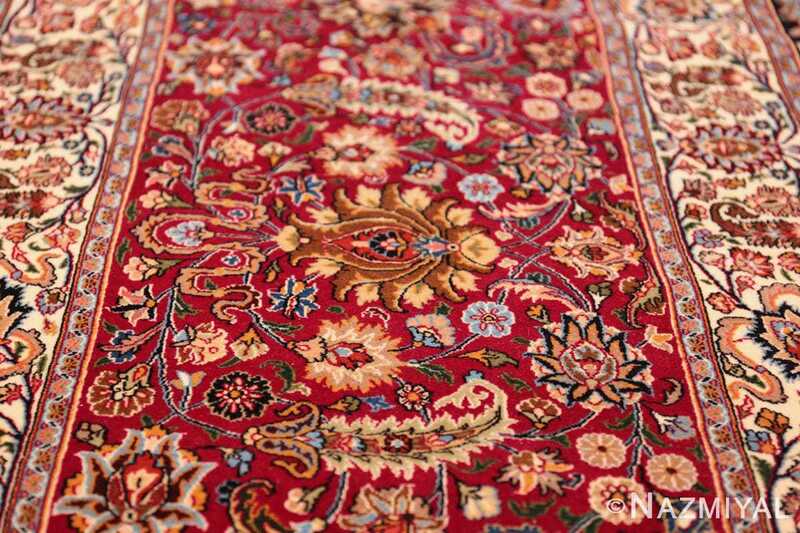 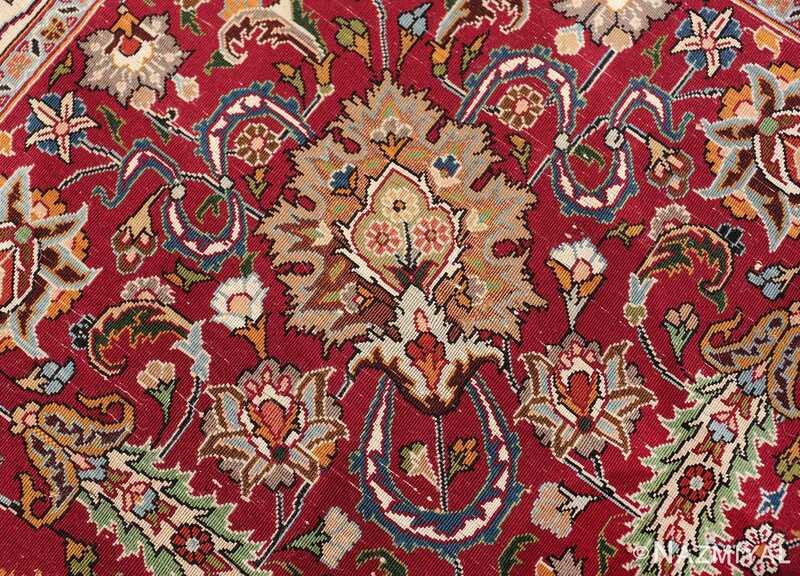 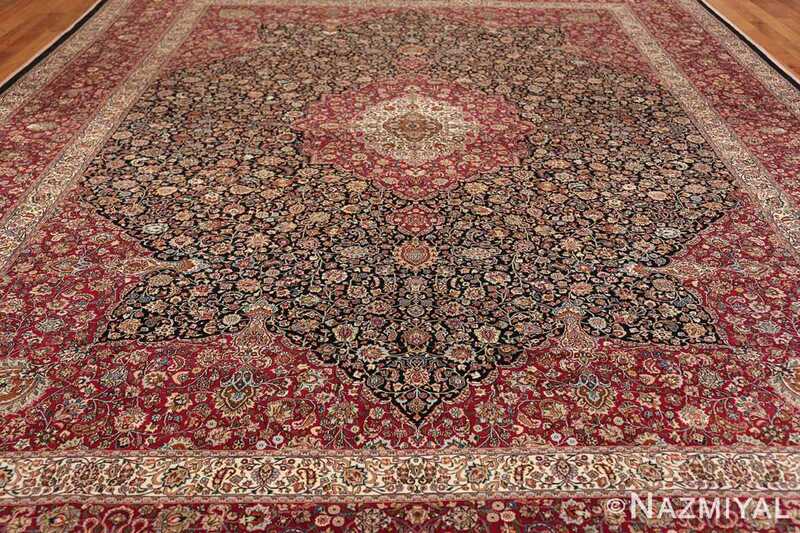 The use of silk highlights throughout the Oriental carpet, gives the rug a bright crisp and refined feel. 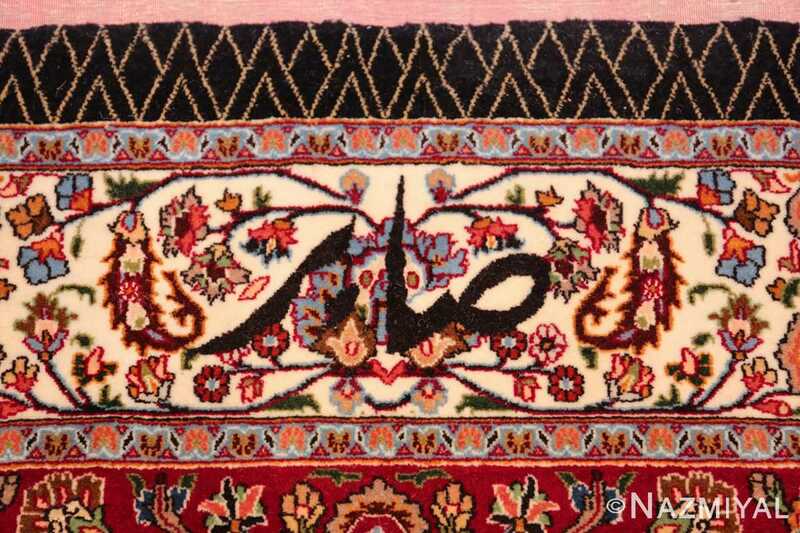 This is mostly created by the pops of the bright colored silk fibers that stand out quite dramatically against the darker blue colored of the background. 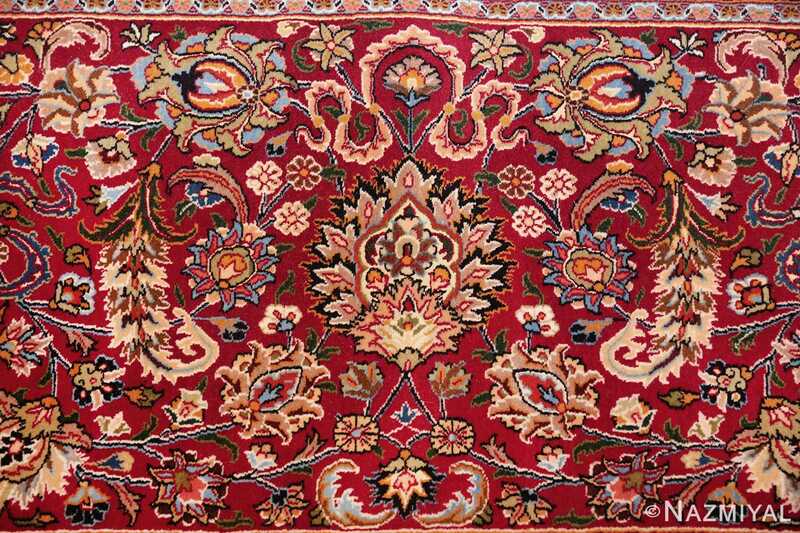 This play of colors and textures are some of the most fascinating aspects of this magnificent and extremely finely woven vintage Persian Khorassan rug. 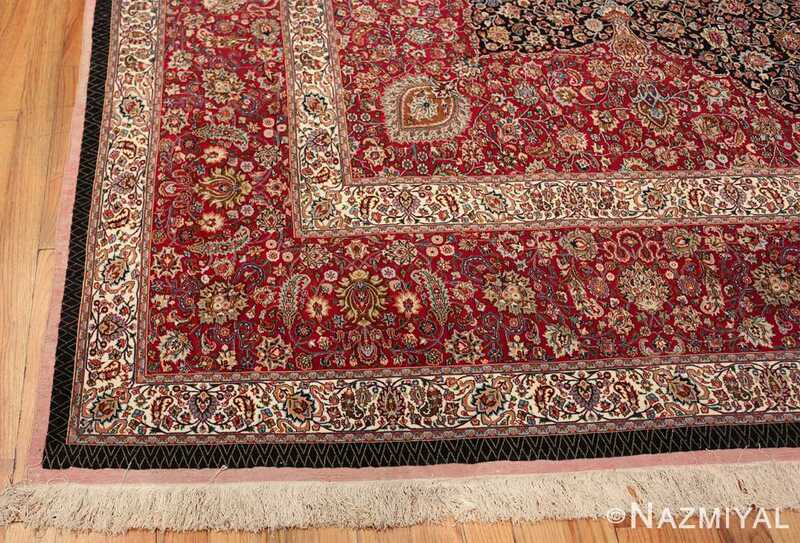 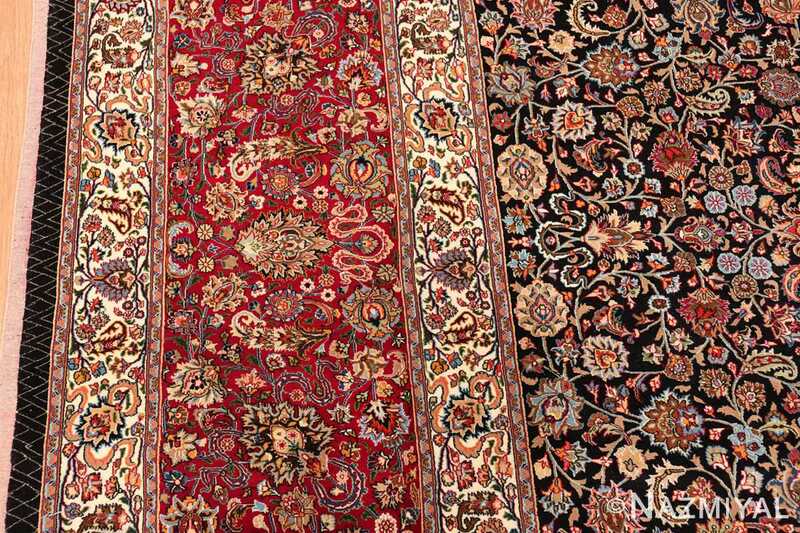 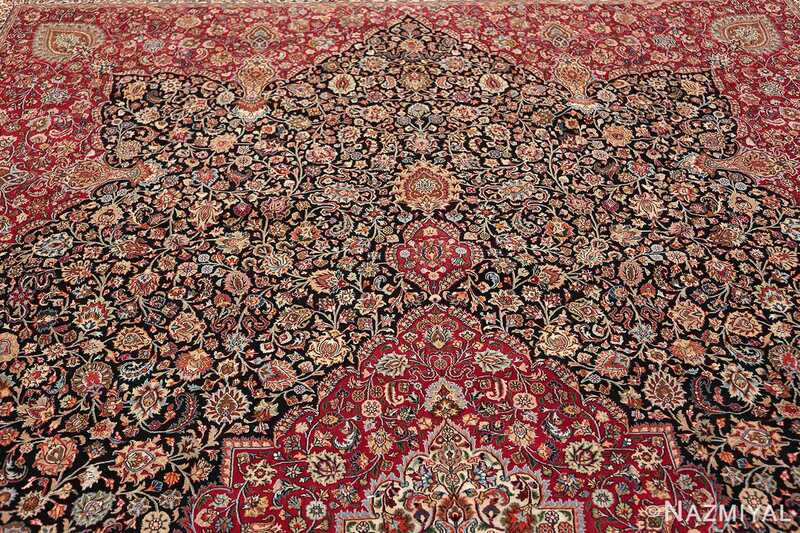 Woven and signed by master rug weaver Saber, this magnificent vintage Persian Khorassan rug is a delightful representation of supreme artistic skill. 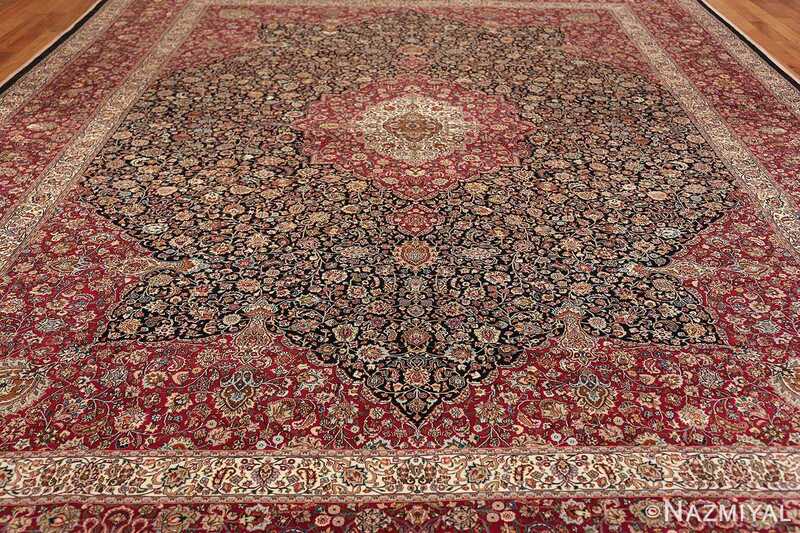 It is so impressive that it is sure to add an elegant and idyllic charm as well as a dramatic splash of color and texture to any interior design space.